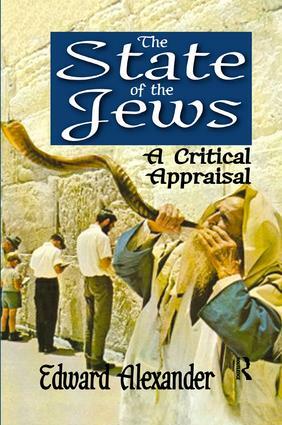 The State of the Jews examines the current predicament of the Jewish people and the land of Israel, both of which still stand at the storm center of history, because Jews can never take the right to live as a natural right.The volume comprises celebrations and attacks. Edward Alexander celebrates writers like Abba Kovner, Cynthia Ozick, Ruth Wisse, and Hillel Halkin, who recognized in the foundation of Israel shortly after the destruction of European Jewry one of the few redeeming events in a century of blood and shame. He attacks Israel's external enemies—busy planners of boycotts, brazen advocates of politicide, professorial apologists for suicide bombing—and also its internal enemies. These are anti-Zionist Jews, devotees of lost causes willfully blind to the fact that Israel's creation was an event of biblical magnitude. Indifference to Jewish survival during World War II was the admitted moral failure of earlier American-Jewish intellectuals, but today's progressives and New Diasporists call indifference virtue, and mistake cowardice for courage.Because the new anti-Semitism, tightening the noose around Israel's throat, emanates mainly from liberals, Alexander analyzes both antisemitic and philosemitic strains in three prominent Victorian liberals: Thomas Arnold, his son Matthew, and John Stuart Mill. The main body of Alexander's book is divided generically into history, politics, and literature. At a deeper level, its chapters are integrated by the book's pervasive concern: the interconnectedness between the state of Israel and the spiritual state of contemporary Jewry. British Philosemitism: A Thing of the Past? Jewish Israel-Haters Convert Their Dead Grandmothers: A New Mormonism?